This species has nearly armless spines flattened against body , looking like a bunch of white spiders crawling on a cactus. Origin and Habitat: Southern America, Brazil (Rio Grande do Sul), Argentina (Corrientes, Misiones) Paraguay [possibly] and Uruguay. Gymnocalycium denudatum var. intermedium auct. Gymnocalycium denudatum var. anisitsii hort., Kreuz. Gymnocalycium denudatum var. boliviensis hort. Gymnocalycium denudatum var. brachyanthum hort. Gymnocalycium denudatum var. brasiliensis hort. Gymnocalycium denudatum var. grandiflorum hort. Gymnocalycium denudatum var. pentacanthum hort. Gymnocalycium denudatum var. roseum Hildm. Gymnocalycium denudatum var. terwinianum hort. 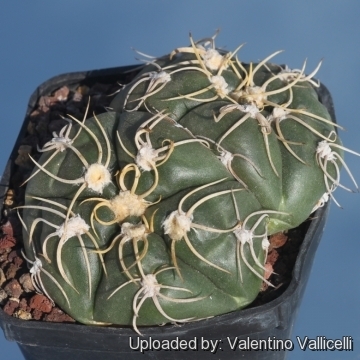 Gymnocalycium denudatum cv. Jan Suba hort. 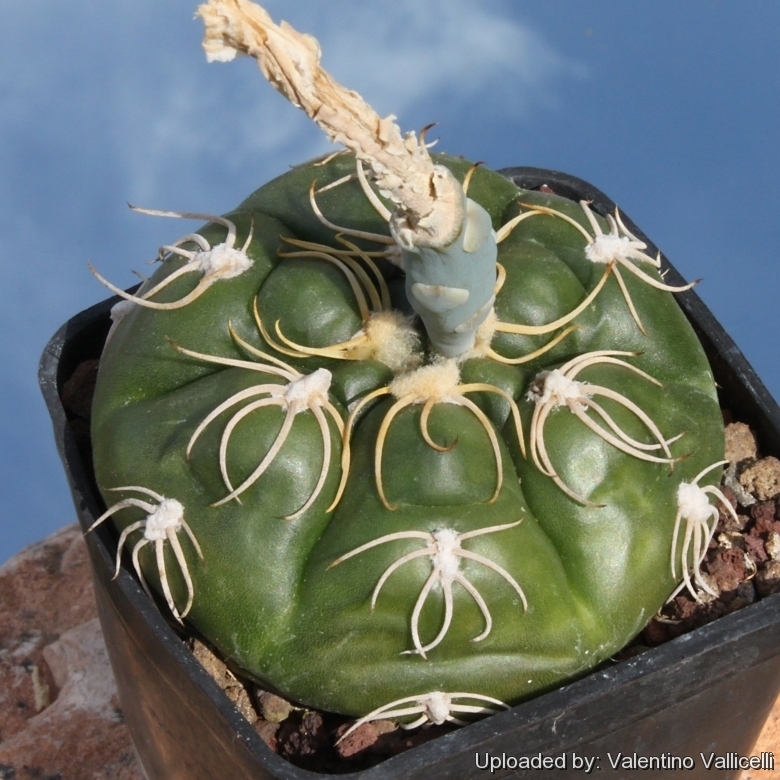 Description: Gymnocalycium denudatum is a small globular, usually unbranched, cactus with glossy dark-green body and rounded ribs. Gymnocalycium denudatum is extremely variable. Stem: Solitary, broadly globular, depressed globose or subglobose, 2-3 cm tall and 6-8 cm in diameter ( up to 10 cm tall 15 cm in diameter in cultivation) glossy greyish-green to dark green. Ribs: Usually 5, occasionally up to 8, flat, with poorly developed tubercles (The 'chin' effect is not as visible as in other Gymnocalyciums). Areoles: Few roundish, slightly woolly 1-2 cm apart. Spines: All radials, spider-like, nearly harmless, 1-1,5 cm long, white or pale rose coloured, awl-shaped, slender, curved laterally or upward, somewhat twisted or bent and closely appressed against body. Flowers: Large shiny cream white sometime very pale rose-coloured , up to 5 cm long and 7 cm wide. Perianth segments oblong, acute. Pericarpel and flower-tube with occasional acute scales. Blooming season: In spring and summer. 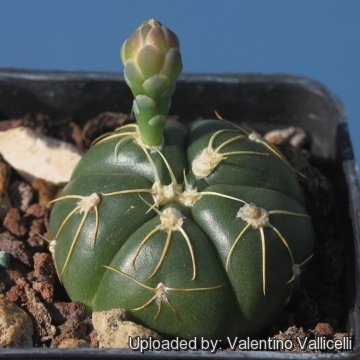 Gymnocalycium denudatum (Link & Otto) Pfeiff. ex Mittler: has a globular usually unbranched stem with glossy dark-green epidermis and 5(-8) flat, rounded ribs, with poorly developed tubercles. Distribution: Brazil (Rio Grande do Sul), Argentina (Corrientes, Misiones) Paraguay [possibly] and Uruguay. Gymnocalycium denudatum subs. angelae (Mereg.) Prestlé: has smaller flowers with red throat and a more opaque and pale green colour of the stem. 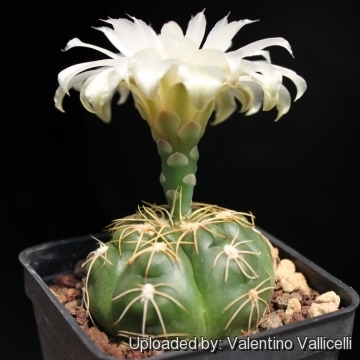 Distribution: San Martin department, Corrientes, Argentina (It is separated from Gymnocalycium denudatum by hundreds of kilometres). 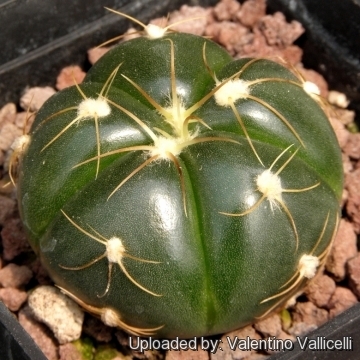 Gymnocalycium denudatum cv. Jan Suba hort. 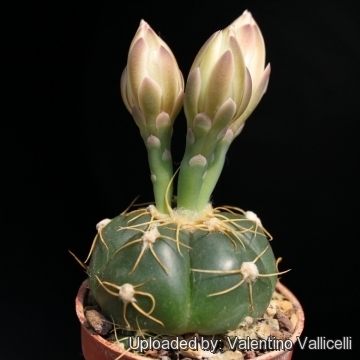 : is said to be an hybrid between Gymnocalycium denudatum and Gymnocalycium baldianum. It has the stem and spination of the former and the lovely red or deep pink flower colour of the latter. 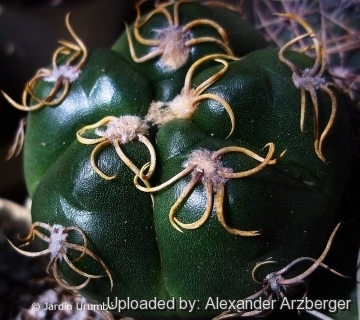 Gymnocalycium megalothelon (Sencke ex K.Schum.) 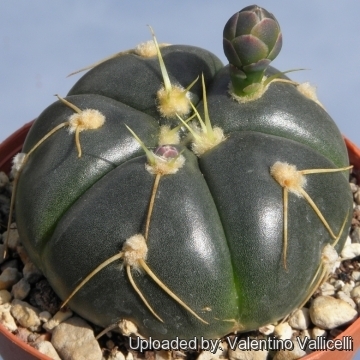 Britton & Rose: is a solitary flattened-globular cactus with a five ribbed appearance and more raised tubercles. The flowers are white and double petaled. Distribution: Argentina (San Luis). 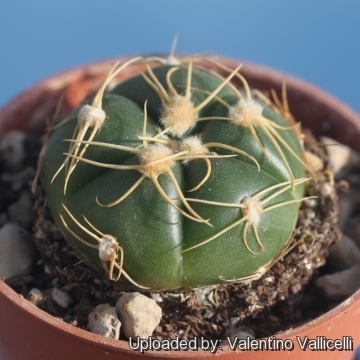 Cultivation and Propagation: Gymnocalycium denudatum is a summer grower species that is easy to cultivate. Hardiness: Reputedly resistant to light frost if kept on the dry side prior to, and during, cold weather (hardy to -2 C ° C, or less for short periods), but for safe cultivation it is best to avoid freezing temperatures.